Pinged for not releasing the ball and Sopoaga belts the ball into touch from inside his half. Nasi Manu makes good ground in attack for the Highlanders now and the ref has his arm out, advantage Highlanders. But the Highlanders want a try. And they are inching closer. 5m out now as Osborne very nearly gets there. 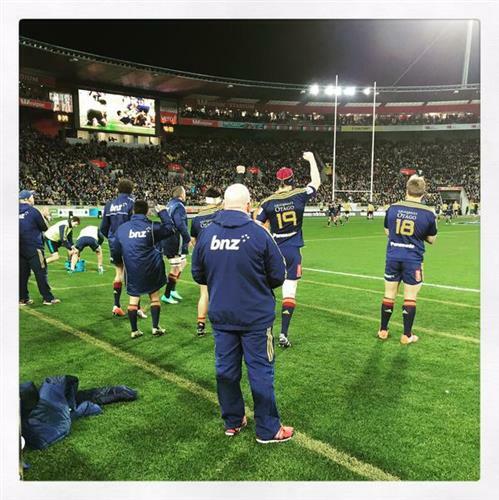 "They said we couldn't" - the final word from the Highlanders as they walked out for the second half. 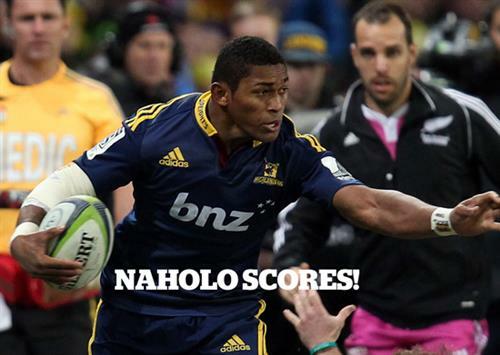 Naholo has scored in the corner for the Highlanders. A well deserved team try. They went close in the right corner, recycled the ball quickly to Naholo who found himself one on one with Savea and powered his way over the line. Yes that well deserved. That's what happens when you don't make mistakes at critical times. the breakdown is key.highlanders trust their systems. lead out by 2 tries.. may be abit early but can I here Bagpipes in the distance ? Sopoaga hits the outside of the upright with his conversion and the ball bounces wide. Highlanders lead 18-8. The Highlanders are playing really well at the moment. This time Aaron Smith punches a well weighted kick in from halfway and turns the Hurricanes defence around. Hurricanes win the lineout and clear into touch. Have found bar in Amstetdam full of kiwis. So exciting with Landers in the lead. Its 30 degrees..cmon Highlanders. Hurricanes can't get any quality possession at the moment. But the Highlanders have lost the ball forward. Hurricanes scrum just inside their half. Hurricanes win a freekick and take it quickly. Perenara breaks away but his pass is loose and finds the ground. Nonu recovers well and sends a well placed kick into the corner. If the highlander score next it is all over for the canes. Canes need to score soon or the Highlanders may run the clock down. PENALTY HURRICANES - Highlanders tackler not releasing. Barrett will kick for goal from about 40m out near the sideline. Great kick from Barrett who slots it down the middle. 18-11 Highlanders now. PENALTY HIGHLANDERS - As the visitors were advancing with pace the Hurricanes were pinged offside. Sopoaga will kick for goal from near halfway. Sopoaga has missed the penalty. A rare miss but a welcome break for the crowd full of Hurricanes fans. And they let him know about it. The Highlanders have knocked the ball on 30m out from their own line now. 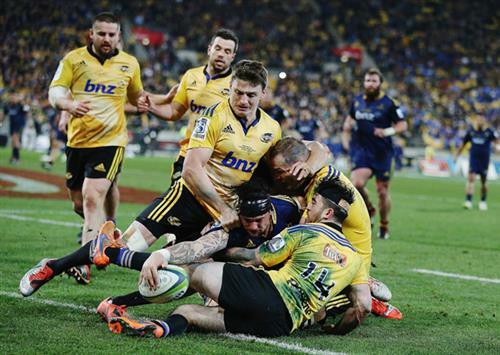 An uncharacteristic slip up from Ben Smith and the Hurricanes have a good attacking opportunity. @DevlinLive Sorry Marty, your boys need to lift their game! Could need a direct link to the Vatican mate!! The Hurricanes work the blindside through Milner-Skudder but he is easily bundled out into touch. We're into the final 20 mins now and the Hurricanes have pinched the lineout. WOW! 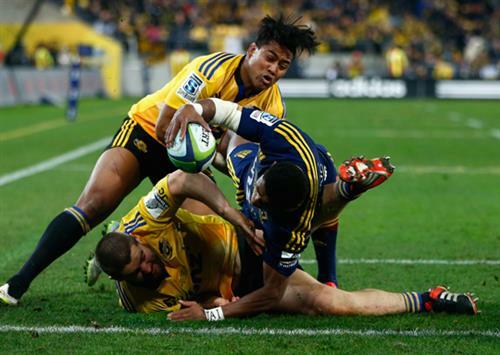 Julian Savea has just butchered a sure thing. The Hurricanes were surging forward, they had numbers wide left, they drew and passed with Savea the last link in the chain. But he dropped the simplest of catches on the line. How costly will that be? Another mistake at a critical time as well as poor goal kicking. 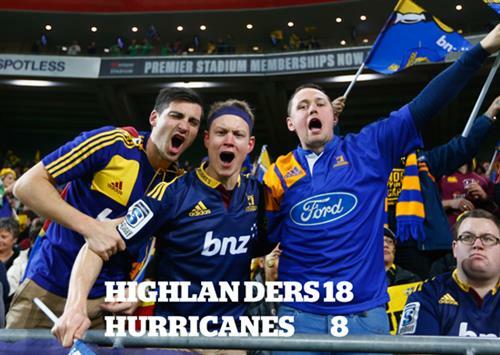 The Highlanders deserve this win. The Hurricanes are coming back again. Barrett is making good ground through the middle of the park. But once again it's good strong defence on the part of the Highlanders. The Hurricanes are really struggling to break through this Highlanders defence tonight. They are so energetic and tough, it's like a brick wall at times. There is an injury break now because Sopoaga is down hurt. Highlanders may still need him. Steve Waugh to Julian Savea: You've just dropped . . .
Hurricanes have charged down a Highlanders kick. Good work from Perenara to put pressure on Aaron Smith and from the resulting play the Highlanders concede a penalty.